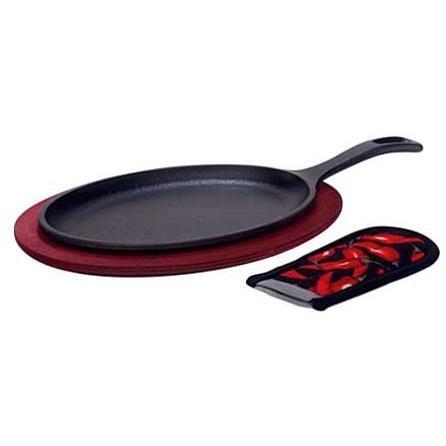 Product Description: Cajun Cookware Seasoned Cast Iron Fajita Pan With Wooden Tray - GL10497-FPS. This Cajun Cookware fajita set is made of cast iron and perfect for serving up the sizzling fajitas! The cast iron pan measures 9. 5 long x 7 inches wide (serving area). Total length including handle is 15 inches. Includes fitted wooden trivet for serving. This Cajun Cookware pan is pre-seasoned to perfection and ready for use. Cast iron cookware makes for superior heat retention and even heating of foods. Heavy-duty and durable, designed to last for years. Hand wash with stiff brush and hot water.